Mix together the oil, tofu, sugar, pumpkin, spices, salt and baking powder. Add flour and stir just until smooth. 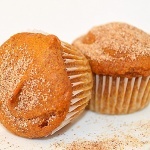 In a muffin (or mini muffin) pan, place a cupcake or mini muffin wrapper in a muffin or cupcake pan and fill only 3/4 full. These will rise, so be sure not to overfill. Preheat oven to 375 degrees and bake for 7-8 minutes or mini, or 20-25 minutes if making full sized muffins. Using a toothpick or cake tester will help you determine doneness. Remove from the oven and let cool for 5 minutes. Loosen the edges ransfer to a wire rack. 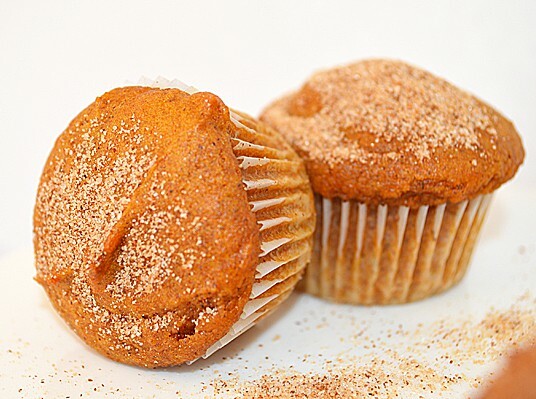 While the muffins are still warm but not as fragile, gently shake them in a bag with the cinnamon sugar. You can also just sprinkle the tops of the muffins heavily rather than coating the entire muffin.